Yelena Simone has taken making castles in the sand to a new level of excellence. 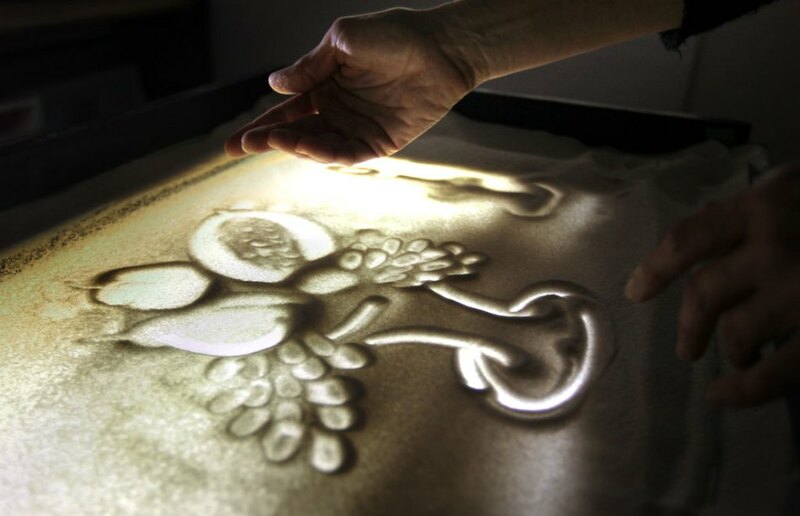 The Windsor artist has turned from traditional visual art to take up sand animation, an awe-inspiring form of performance art which she creates right before your eyes, only to wipe it away and start anew. It’s a live-action graphic novel, actually. Simone calls it a sand show. 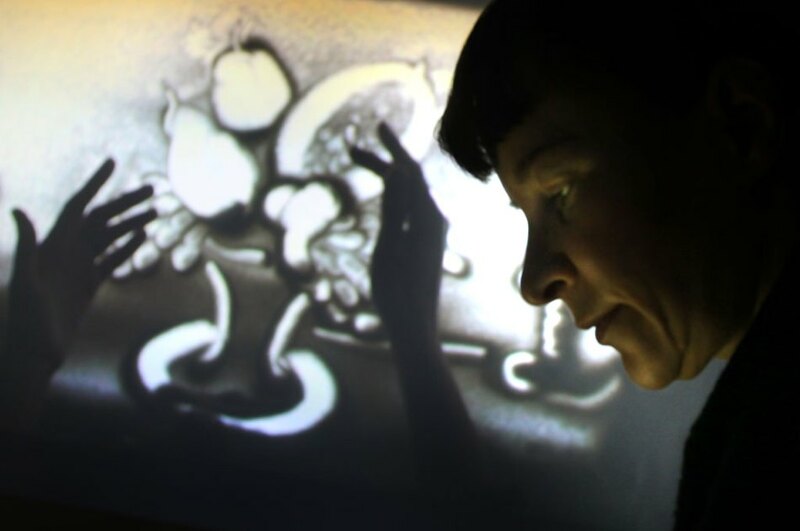 Using a simple photographer’s light table and an overhead camera, Simone works like a club DJ, swirling and shoving the sand with her fingers into monochrome shapes which are arranged in sequence to tell a story. It’s pure magic. The images are transferred to a large screen behind her, usually accompanied by a musical score or nature sounds, and choreographed to the split-second. This Sunday at 10:30 a.m., Simone will fashion a sand-and-light show about the Christmas Nativity at Unity Church, 3640 Wells St.
Simone compares what she does to a filmmaker. Before a show, she writes a script, sketches each frame in the storyline, selects musical accompaniment or has it scored, then practices it several times. Simone emigrated to Canada 20 years ago from Russia with her engineer husband, Eugene. By that time, she had already established herself as an abstract artist and her work hangs in nine galleries throughout Russia and Ukraine. In Canada, she continued to paint and even set up an interdisciplinary art school, KidsArtSmart Inc., in Windsor. But her attention was drawn to sand animation about two years ago. While a relatively new art form in North America, it is well-established in Europe and Asia. In some countries, in fact, the practice is used as healing therapy. “Kids especially love to dig their fingers into the cool sand and swoosh it around,” Simone said. Each image forms the basis of the next one, so sand animation demands a high degree of concentration. It’s like a chess player planning several moves ahead. Simone has performed at a variety of events, from birthday parties and religious celebrations to business meetings. Before she performs, she researches each subject for hours ahead of time. Since each show is recorded onto a CD as it happens, it can be taken away as a keepsake. When not doing live animation, she prepares short films which allow her the luxury of editing. Simone is also a former competitive ballroom dancer. She has taught ballroom and jazz dance in her LaSalle home, as well as at the University of Windsor and Mackenzie Hall. With that in mind, her choreographed creations can be seen as an extension of the dancing. Born Elena Semenov in Minsk, Russia, she has a master of fine arts from the State University of Belarus. For three years until 1991 she was also a professor of art at the institution. In 2008, as a means of keeping her mind alert, she obtained a bachelor of science from the University of Detroit Mercy. Simone won the Manitoba Graphic Design Competition in Winnipeg in 1998 while working for the federal government as a graphic designer. She was also artist-in-residence at State Art Studio in Tel Aviv-Jaffa, Israel, for two years in the 1990s. Her paintings and drawings have attracted followers around the world. Besides the public collections in Russia, Simone’s work is in dozens of private collections in North America, Europe, Japan and the Middle East. To learn more about the sand animation of Yelena Simone, email her at yelenasimoneart@gmail.com.